This topic contains 10 replies, has 3 voices, and was last updated by admin 1 year ago. 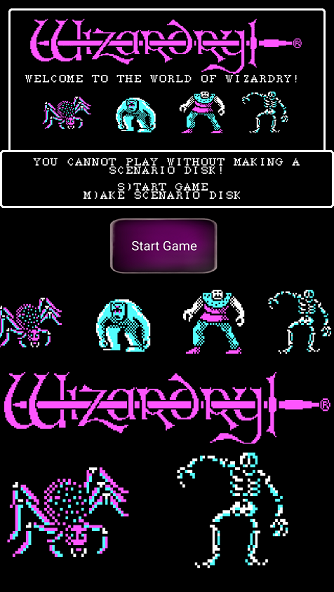 When Wizardry came out in 1981, it was ahead of its time. The game has surprising depth and detail. In its day, it was one of the most complex and ambitious programs running on micro computers (at first only the Apple II). The authors spent nearly a year just play testing and adjusting the game balance. For new players, beginning with the Manual is required. Don’t let the lack of automapping discourage you from trying this out. There are excellent maps available Here. 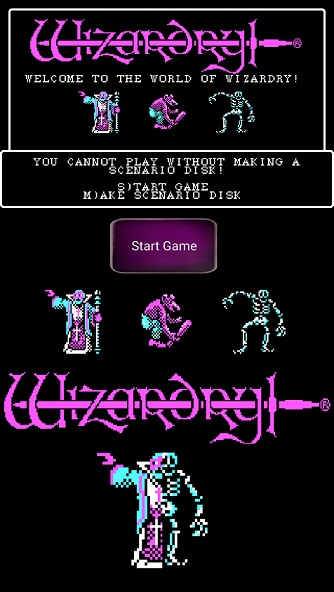 The version of the game that I am using is from the Wizardry Ultimate Archives CD. Here’s an mgc for Wizardry I Proving Grounds of the Mad Overlord. This is the splash screen, using several telescope widgets. There is actually a hidden mini game here to generate hybrid monsters. Tapping on the telescoped images will send a key to the game and display new monsters. When 3 monsters are displayed in a row, the 2 outermost are combined into a weird conglomerate creature. In the second image below you can see I’ve successfully generated a “Half Undead Priest”. This is the castle layer. “Auto Form Party” will automatically add the first 6 characters on the training roster to a new party. This can easily be customized to match your specific requirements. 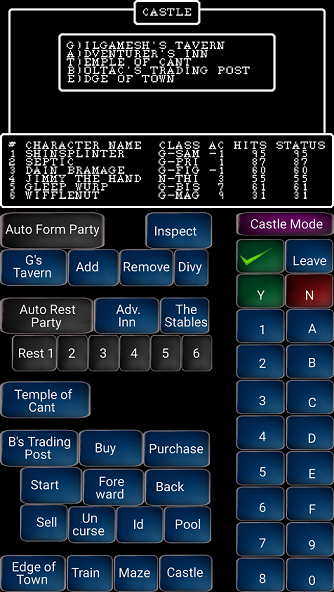 “Auto Rest Party” will rest all party members in the stables, while “Rest 1” … “6” will rest just individual members and pause on the “Rest status” information page. The “green check” button is the enter key. 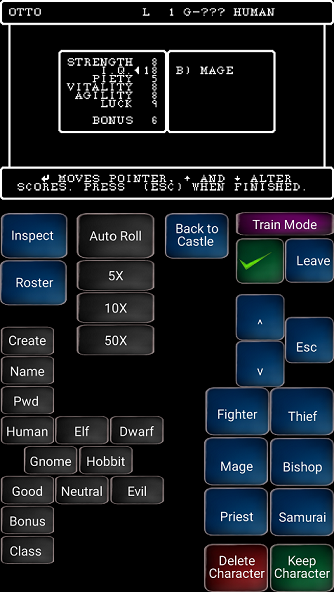 Tapping “Train” from the castle layer will navigate to the training layer seen below. “Auto Roll” will automatically roll a new character (named Otto) and can be customized using the combos in the bottom left corner. It is set to assign bonus points to IQ and then attempt to delete the character. If it fails to delete it means the character has more bonus points to distribute. 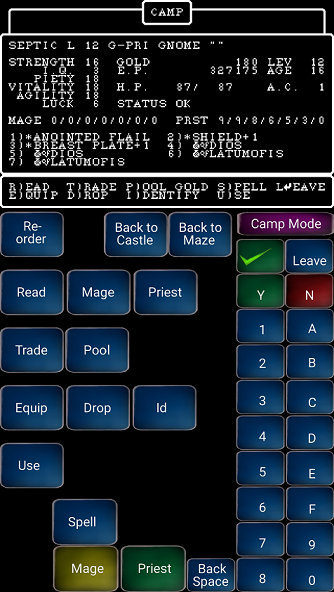 Tapping “Auto Roll” again at that point will attempt to assign the remaining bonus to agility and delete the character. If the character remains at that point it means the generated bonus points are around 22 or 23, which is an excellent roll. You can then redistribute the points to attributes as you see fit. The 5X, 10X, 50X buttons simply repeat the process more times to relieve you of the tedium of continually pressing “Auto Roll”. If a character has over 22 bonus points, it should not be deleted by this and the combo will eventually stop sending input and then you can edit the character as you like and save. Once back to the castle, tapping “Maze” will take you to the camp layer. In the second image is the bag of priest spells opened during camping. A similar bag is there also for the mage spells. 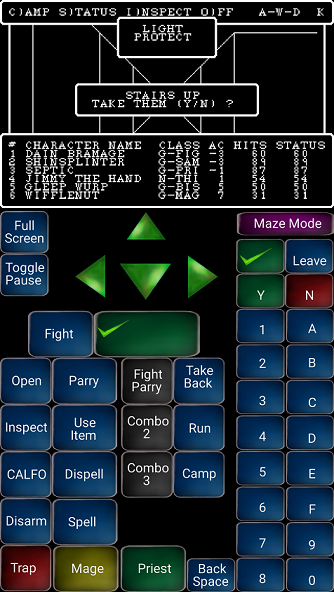 The maze layer has a combo “Fight Parry” which auto attacks monster group 1 for the first 3 characters and parries with the second 3. The other combo slots are left for user customization. There’s a bag for trap disarming as seen. Thanks Alex. I’ve had a lot of fun creating this over the past few months while I played through the first 3 levels of the dungeon. 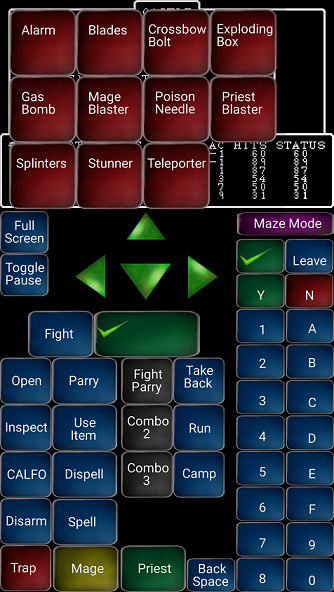 I just worked slowly on improving the controls as I played, and ended up redoing the whole interface a few times. I literally spent weeks just coming up with better ways for rolling characters. The Magic Dosbox concept and widgets and editing tools are just awesome. I’m very impressed with this system and look forward to working on more games. Lol, yeah. I think I’ve spent more time on creating layouts than playing the actual games (with some exceptions of course 😉). Oh, this is really awesome, hat off, you really put a lot of work into this layout. It reminds me another game – Might and Magic 1. 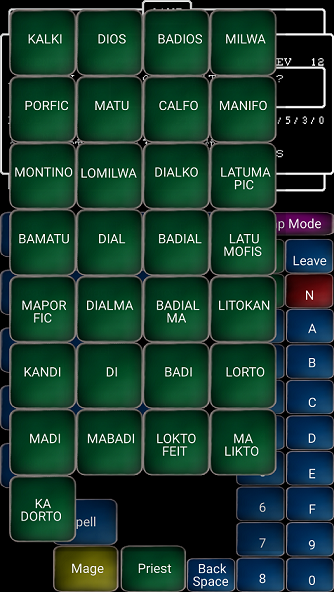 This game was real reason why were widgets implemented. Btw, try using layers instead bags. Layers were implemented only 5-7 versions ago, but are more versatile and can be hidden and shown in runtime like bags. Thanks for your feedback and suggestions. I will give your MM1 a try. I already have 7 layers in my layout, but when it came to the spells, I used bags. I think because of a tutorial video I saw. Anyhow, I was trying to arrange and resize things in a bag to no avail, and now I see that using a layer is a better option. Next version will be better! Yes, bags were here from beginning and layers are now doing almost the same. But bags will receive scrolling feature in the future, they will be still very useful.